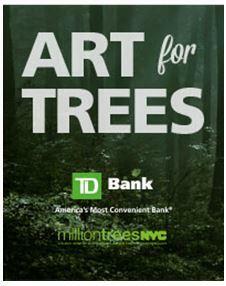 Bridgette Mayer, Bridgette Mayer Gallery is pleased to announce a project she curated for TD Bank: "TD Forests: Art for Trees". Partnering with Tierney Communications, Mayer interviewed over 50 artists to get her curatorial selection down to 15 artists in which Tierney and TD Bank selected the final 10 artists who they felt had a tremendous commitment to the environment and a greener New York through the ideas and stories within their artworks. Each artist was asked to create or provide an original piece of art with a green message. Replicas of the artwork are currently on display in the windows of more than 100 TD Bank Stores in New York City - creating the effect of a virtual art gallery across the city's five boroughs. The original pieces of art will be available for sale, and proceeds will be donated to local environmental non-profit organizations. The original artwork will be on display for the public in a pop-up gallery in Vanderbilt Hall at Grand Central Station from October 6-12, and in the 14th Street Passage on the High Line on October 24. The art will also be displayed at a pop-up gallery at New York Restoration Project's (NYRP) annual masquerade ball, Hulaween, on October 31. The 10 artists, who donated original pieces of art for "Art for Trees," all have ties to New York City. They include: Federico Herrero, Sharon Harper, Dustin Yellin, Ivan Stojakovic, Eileen Neff, Philippa Lawrence, Clara Fialho, Kathleen Vance, Elizabeth Whalley, and Julie Goldstein.